Duke Nukem 3D: Megaton Edition is the definitive compilation of the landmark first-person shooter that includes enhanced versions of Duke Nukem 3D: Atomic Edition and three unique expansion packs as well as the original version of the classic game. The iconic Duke Nukem battles it out against a slew of alien foes in the original four episode "Atomic Edition" single-player campaign and three over-the-top expansion packs that take the loudmouthed hero to a tropical paradise, a winter wonderland, and even Washington D.C. Duke Nukem 3D: Megaton Edition features polished OpenGL visuals, native compatibility with modern PC and Mac computers, Steam Achievements, and Steam Cloud support. 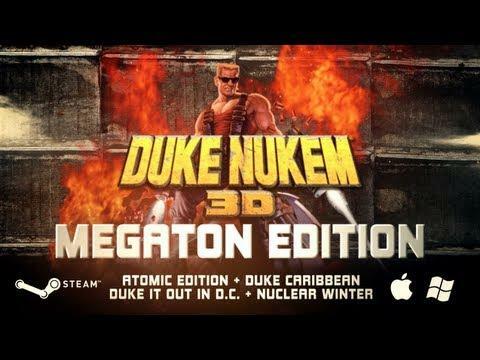 Duke Nukem 3D: Megaton Edition will continue to receive feature updates including Steamworks-enabled online multiplayer, new achievements and integration of additional Duke Nukem 3D expansion packs. As of today the Beta for Linux is now officially up as per their announcement here. It's looking like multiplayer is still happening too, I imagine it would be pretty fun to play Duke Nukem in multiplayer on Linux, who's with me?! Hail to the king baby! Really looking forward to playing this and The Shadow Warrior again. Humble bundle is starting to piss me off. Missing executable? Is anyone else getting this? I'm running Ubuntu 12.04.2.
cfultz Missing executable? Is anyone else getting this? I'm running Ubuntu 12.04.2. You need to switch to beta. Rightmouseclick on the game. On updatetab select public beta.